There are no speed limits on the road to success. And you shouldn’t face speed limits while loading mobile web pages because nobody wants to waste time. I’m really tired of waiting the needed info appears on the screen of my smartphone. In fact, research showed that 53% of mobile customers leave the site if it doesn’t load within 3 seconds. Just imagine that most sites take 14—19 seconds on a 3G and 4G connections. Thankfully, Google’s Accelerated Mobile Pages project has freed most mobile websites of this disaster. So, what is AMP? AMP is a framework that allows developers to create mobile pages delivering content faster. Ecommerce retailers who want to try this technology on their new web project can use one of TemplateMonster’s premium Magento 2 templates with AMP built-in. By the way, for three days only, on April, 9, 10, and 11, you can save 35% on any Magento template and not only! So, it’s a great chance to start a new affordable online project and test AMP extension for Magento 2. So, let’s make sure that your website does need this technology. Mobile version of a site is crucial for any modern business because more than half of searches are conducted on mobile and this figure is extremely increasing with each passing year. Marketers and business owners need to be prepared to catch up this web tendency. Google’s AMP initiative is the necessity made in accordance with the latest trends and requirements. If your website is not working well on tablet or mobile taking more than 3—5 second to load, you will lose your potential customers. Due to using light-weight architecture, the speed of AMP pages is undeniable because they load instantly, four-times faster compared to traditional pages. This technology removes all the speed-robbing elements from websites by limiting custom JS and by rendering users directly on search results. AMP pages consist of three elements: AMP HTML, AMP JS, and AMP Cache. AMP takes control of the entire load chain juggling priorities: the third party content follows the main content. Coding with AMP has a number of undeniable advantages for your ecommerce business. Let’s have a look at the top 5 benefits. Mobile web pages load considerably faster. Imagine the needed website loads like lightning on your mobile device, smartphone or tablet. Your customers won’t need to wait irritating three and more seconds when the page appears on the screen. Previous studies showed that most mobile users abandon a site that takes much time (more 3 sec) to load. So, AMP initiative will decrease mobile abandonment rates and boost conversions. AMP gives an opportunity to improve search engine ranking. In fact, mobile-friendly and fast loading websites get the prime page ranking. As AMP efficiently improves both features, it’s very much likely that your AMP-powered site will get better SEO ranking on Google (read also: Key SEO Tips for Any Ecommerce Business). AMP provides your site with improved CTR. The sites, complied with AMP technology are labeled with a specific symbol ‘AMP’ and in green. Mobile users can purposefully opt for such a website in order to get the more efficient result. Additionally, Google has started to display the AMP content with large images that also attracts the attention of mobile users. AMP is an effective support for displaying ads. It can be very helpful for those marketers and business owners who want to boost their revenue by means of showing ads on their web pages. The initiative supports a wide range of ad networks and formats that will help advertisers to improve their ROI on ad spend. AMP provides efficient analytical solutions. In order to track visitor behavior on websites (visitor counts, new visitors vs. returning, the number of clicks and other actions) you need to choose from 2 tags. Analyzing these factors will help you improve your weak points. That said, AMP is an efficient technology that can also reduce the load on your server and improve the overall performance, especially if your website has tons of visitors per day. There are a number of well-known publishers supporting AMP: BBC, New York Times, Washington Post, etc. You may try the Google’s initiative with Magento 2 templates and join that list of successful websites. Shopy is an elegant and stylish, tech-savvy and fast loading, sleek-looking and carefully designed Magento theme with AMP initiative built-in. Your commercial website will look perfect on any screen with any resolution and load less than 3 seconds. The theme comes with dozens of pre-made layouts and listing pages allowing you to opt for the most appropriate variant for you. Megamenu will let your website look comprehensive, complex and fully-fledged. Moreover, the template features improved layered navigation that will make your customer’s shopping experience more engaging and convenient. Shopy welcomes your customers with a captivating Revolution slider at a glance. 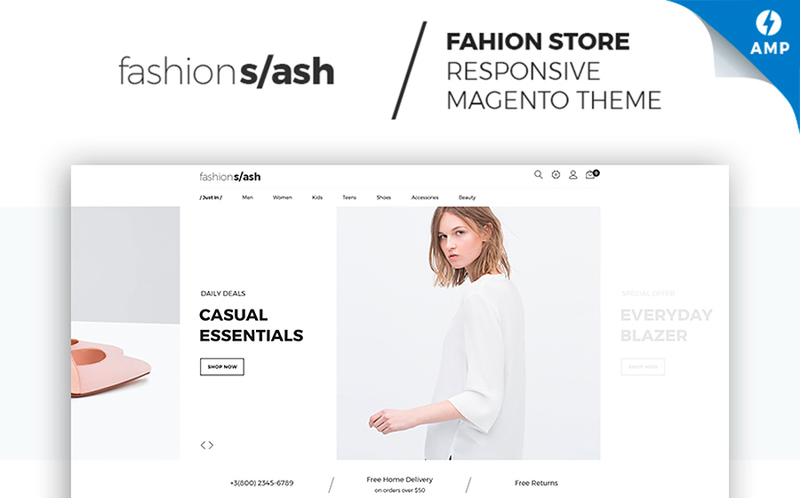 Fashion Slash is a polished-looking and well-structured Magento 2 theme empowered by AMP framework. The theme will come in handy for those who are looking for a light-weight, responsive, catchy and feature-rich foundation for setting up a solid webstore. Thanks to multiple sorting options and various products types, your site will satisfy even the most sophisticated customers making them return to your shop. With effective background options and amazing image slider, you will showcase your products in an efficient manner. In addition to comprehensive documentation and friendly support, you achieve clean and valid code developed in accordance with the latest web trends. The world has gone mobile, so try to keep up with the times and adjust your web business to modern trends. Using AMP-based Magento templates for your ecommerce venture, the average load time can be reduced up to 85%. Interested in other ways to optimize a Magento-based site? Check out the article, where we compiled a list of effective methods to speed up your store.